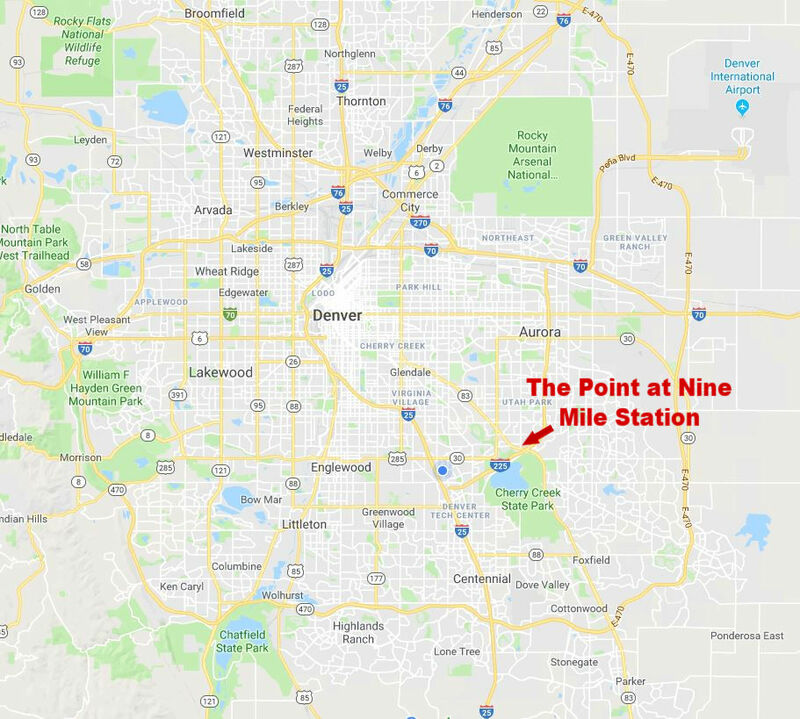 The POINT at Nine Mile Station may be the hottest redevelopment in the Denver 7-County Metro Area. The redevelopment of this highly visible stop along RTD’s R Line at Nine Mile Station, expected to bring new and vibrant housing and live-work choices in a unique urban environment. Upon completion, the multi-phased redevelopment of Regatta Plaza, which will be renamed The Point at Regatta Plaza, will feature more than 500 units of residential, 100,000 square feet of retail space and up to 250,000 square feet of commercial space. In addition, both King Soopers and Key Bank, both of whom currently occupy space in Regatta Plaza, will be relocated to the new site. The city of Aurora and the Aurora Urban Renewal Authority, along with the Master Developer, Mile High/Koelbel (MHK), announced this spring that Kroger, the corporate parent for King Soopers, has approved corporate funding to enable construction of a new 79,000-square-foot King Soopers store to proceed on the site at Parker Road and Peoria Street. Construction has began on site improvements and infrastructure this summer to accommodate the new King Soopers store while the existing store remains open. 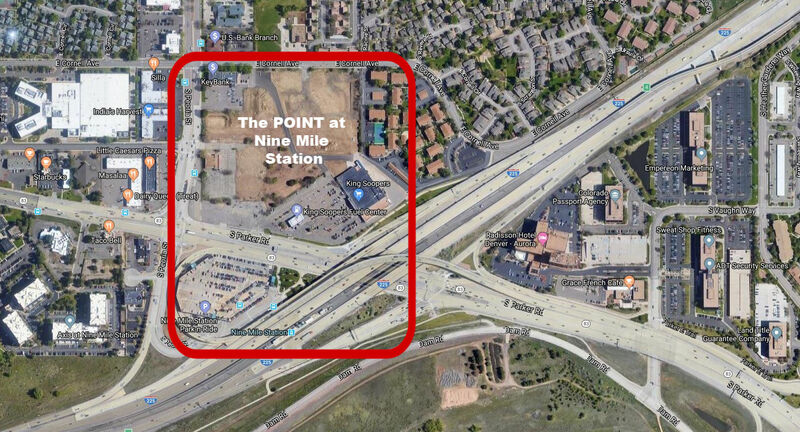 MHK is also proceeding with the development of a 24,000-square-foot retail facility on East Dartmouth Avenue to include a new Key Bank facility and other retailers.The POINT at Nine Mile Station may be the hottest redevelopment in the Denver 7-County Metro Area. The redevelopment of this highly visible stop along RTD’s R Line at Nine Mile Station, expected to bring new and vibrant housing and live-work choices in a unique urban environment. The city of Aurora and the Aurora Urban Renewal Authority, along with the Master Developer, Mile High/Koelbel (MHK), announced this spring that Kroger, the corporate parent for King Soopers, has approved corporate funding to enable construction of a new 79,000-square-foot King Soopers store to proceed on the site at Parker Road and Peoria Street. Construction has began on site improvements and infrastructure this summer to accommodate the new King Soopers store while the existing store remains open. MHK is also proceeding with the development of a 24,000-square-foot retail facility on East Dartmouth Avenue to include a new Key Bank facility and other retailers. Once the King Soopers store is complete in the summer/fall 2019, MHK will demolish the old store to pave the way for the next phase of development, which will include a mix of retail, entertainment, restaurants and dense, mixed-use residential. A future pedestrian bridge connecting the site to the Nine Mile Station also is planned. The Aurora Urban Renewal Authority selected MHK as the Preferred Master Developer of the 22-acre site in mid-2015 to work with the authority and the four landowners to assemble the site and complete environmental remediation and demolition, which was completed in early 2017. In mid-2017, MHK and the city’s Planning & Zoning Commission successfully completed the master plan, providing a framework for the overall redevelopment. Since then, MHK has been working with King Soopers and Key Bank to design and plan their new facilities. A grand opening for the north half of The Point, including the new King Soopers store and the retail facility that will accommodate a new Key Bank, will occur in fall 2019. The redevelopment of this highly visible stop along RTD’s R Line, with easy connections to major job centers, is expected to bring new and vibrant housing and live-work choices in a unique urban environment. Neighbors played a pivotal role in shaping the vision for the project. Located along the R Line in the median of I-225, the station is accessed via a passageway that connects the 1,225-space RTD parking garage and bus transfer facility with the station. The Nine Mile area is situated on high ground at the intersection of Parker Road and I-225, one of the most significant transportation nodes in the metro area. With stellar mountain views to the west, the station area also is adjacent to the 4,200-acre Cherry Creek State Park. Potential development sites can take advantage of proximity to the light rail station as well as visibility from Parker Road. The Nine Mile station area includes more than 160 acres of existing commercial property along Parker Road. The Nine Mile Station Area Plan and the Nine Mile Station Urban Renewal Plan present a vision for development of a compact, higher-density mixed-use area centered on the 21.5-acre site commonly known as Regatta Plaza.